The town of Maltahöhe was named after Malta, the wife of German policeman Hauptmann Henning von Burgsdorf who manned the little settlement in 1895. 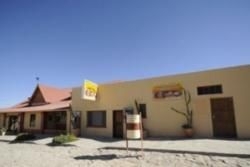 The oldest country hotel in Namibia, the Maltahöhe Hotel, was built here in 1907 and today the town can be used to access some of the biggest attractions in the area such as Sossusvlei and Duwisib Castle. As a supply town to the surrounding farming community, it also houses a filling station, small shops and a backpackers area with camping site.